The summer (that never started here in Switzerland) is definitely over and the festival season is finished as well. The club season started already but gains full speed now with all major clubs having a complete program in place. I added some events for the next 2 weeks in Bern, Fribourg and Lausanne and I have to say, that great music is on its way. I will also commence again writing regularly. I got a lot of new CDs, which are worth to talk about and I saw and hopefully will be able to see interesting concerts in this season. 1. 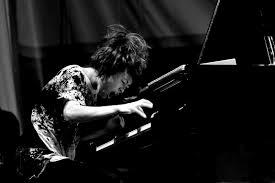 Hiromi comes to Switzerland: Japanese pianist and composer Hiromi Uehara gives four solo concerts in Switzerland. Form March 27 to March 30 she plays in Basel, Geneva, Berne and Lucerne. The concerts are all in classical concert halls, where usually symphony orchestras are playing. So extra challenge for her, because I would assume the audience attending these concerts has a more classical background. 2. Jazzfestival Bern: The other event that is around the corner is the Jazzfestival Bern. This festival starts on March 17. The opening night features Roy Hargrove on trumpet and italian singer Roberta Gambarini with the Swiss Jazz Orchestra. Closing night of the festival is on May 24 with Terry Lyne Carrington’s “Money Jungle” and the Ellis Marsalis Quartet. In between there will be concerts with Terence Blanchard, Cassandra Wilson, Kevin Eubanks and Spyro Gyra. Even if I think this festival is a little bit too much spread over two months it allows you to see free concerts with great food in a tent outside the hotel “Innere Enge” and the guys at the jazz festival Bern have the right touch to find interesting young musicians to play there.